Many people are surprised to learn that, currently, Florida has no alimony guidelines. Rather, it has a bunch of factors that a judge considers, such as lifestyle of the parties, each spouses’ contribution to the marriage, and the age and physical condition of each. 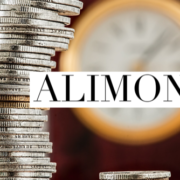 This has left many clients frustrated when they ask their attorneys how much alimony they should expect to pay or receive. House Bill 943 looks to change this.